There are breakfast people and those who gag at the thought of eating before noon. I am among the former. I wake up every morning ravenous for breakfast. What I would like to eat and what I do eat are polar opposites. I long for pancakes topped with over-easy eggs and real maple syrup. I dream of fried mush dabbed with butter and drizzled with maple syrup. I yearn for brown sugar-sweetened oatmeal showered with fruit and nuts. What I do eat: Yogurt. Cottage cheese and blueberries. Scrambled eggs and a few grapes, hold the toast. Low-carb eating can be the pits. Low-carb breakfasts can also be boring, which is why I was intrigued by an inane new product, Crack an Egg. It consists of a little cardboard bowl of various chopped vegetables (onions, green peppers) and shredded cheese. You crack an egg into the stuff, stir and microwave for about a minute, stirring midway through. Why inane? Because you can do this so much better yourself — fresher, cheaper and without the excessive packaging. I bought a couple of the packages, tasted and then started making my own. I made delicious versions such as scrambled egg with kalamata olives, cherry tomatoes and feta cheese hit with some oregano, and egg with lox, capers and a squeeze of lemon. My favorite was probably the creamy mugful of leftover Easter ham, ricotta cheese and an egg seasoned with a grind of nutmeg. In the summer when my herb garden gets going, I’ll add mix up even more varieties. Yum. If you are pressed for time or just stupid-sleepy in the morning (as I am), you can chop a bunch of ingredients and freeze them in little portions just right for microwaving with one egg. The only caveat is that you must be careful not to overcook the egg. Too much microwaving yields Styrofoam-like eggs. At high power in my 1100-watt oven, an egg with two or three tablespoons of add-ins is set and creamy at 50 seconds; at a minute, it tastes like packing peanuts. A recipe with 1/2 cup add-ins, such as my ricotta-ham egg cup, cooks up creamy and tender in 70 seconds, stirring after the first 20 seconds. These simple scrambles are low-carb, lightening-fast solutions to breakfast boredom. Combine all ingredients in a pottery mug and beat with a fork. Microwave on high power for 20 seconds. Stir. Microwave 20 seconds longer or until eggs are mostly set. Stir. Let stand 1 to 2 minutes before eating. Serves 1. Combine capers, lox, egg, butter, salt and pepper in a pottery mug. Beat with a fork. Microwave for 20 seconds on high power. Stir well. Microwave 20 seconds longer or until eggs are mostly set. Stir. Let stand 1 to 2 minutes. Top with sour cream. Serves 1. Combine all ingredients in a pottery mug. Beat very well with a fork. Microwave on high power for 30 seconds. Stir. Microwave for 40 seconds longer or until eggs are almost set. Stir and let stand for 2 minutes. Serves 1. Exactly right, Mitch. The answer is that tilapia has been here all along but on another continent — Africa. It reproduces like crazy, which is why someone (I couldn’t find out who) got the idea to farm it and sell it to Americans. Tilapia is actually an umbrella name for a bunch of fish called “cichlid.” A lot of them look like goldfish or koi. I do not eat tilapia because most of our supply comes from China, where U.S. safety standards do not apply. The tilapia farmed there are raised in freshwater lakes in such concentrations that they live in their own waste. They are kept “healthy” with chemicals. They are an invasive species, so when they escape to unfarmed waterways, they decimate the native fish population. Add to this the fact that tilapia are low in omega 3 fatty acids — the reason we’re told to eat more fish — and you have plenty of reason to ditch tilapia in favor of wild salmon and trout. Bottom line: If you can find tilapia farm-raised in the U.S., go for it. The next-best choice is tilapia from South American fish farms. Otherwise, skip it. At least tilapia is in no danger of being overfished like our past piscine obsessions. Remember the orange roughy craze? Swordfish mania? White sea bass (actually, Patagonian triggerfish) on every restaurant menu? Unlike those fish, tilapia is in plentiful supply. I just don’t know if you’d want to eat it. Enchilada casserole; egg salad; roasted steelhead trout with cubed potatoes, brussels sprouts, Greek olives and cherry tomatoes with oregano and olive oil; pan-grilled top sirloin steak with wine sauce, pan-grilled asparagus with sesame oil, cherry tomato and feta salad; lentil soup; baked honey-glazed ham and cornbread. Mu shu pork with Chinese pancakes and a shrimp and green bean stir fry from Chin’s Place in Akron (both dishes were excellent); rice cakes with shrimp and hot jasmine tea at Han Chinese Kabob in Cleveland; eggs over easy, grits, bacon and a biscuit at Cracker Barrel. I’m pleased to see you finally got to try Bombay Grill’s tomato soup. It’s one of the best soups I’ve eaten and certainly the best tomato soup. Perhaps you and your readers could make an attempt at duplicating the recipe. I’ve had little luck getting the ingredients from the owners. I’d love to make a big batch, portion freeze it and have it whenever I’d like. Your readers should know about a favorite Asian restaurant of mine in North Canton called Mint and Lime. I’ve been going there for a couple of years and it’s better than most local Asian places and comes close to being as good as those in Cleveland. Everything I’ve had there has been exceptional. Here’s the website: http://www.mintandlimeasianbistro.com. The flavors of that soup are too complex for me to figure out. Does anyone else want to take a crack at it? I found many versions of Indian tomato soup on the Internet, but none that sounds like the soup I had at Bombay Grill. I see that the owners of Mint and Lime are related to the owners of my favorite Asian place, Basil Asian Bistro in Canton, so I’m not surprised it’s good. Thanks for the recommendation. I finished a big writing project on Saturday and celebrated with a fun dinner. 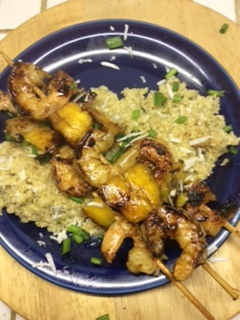 I made an intensely coconut-y quinoa and topped it with skewers of shrimp and mango chunks lacquered with sweet soy sauce and seared in a skillet. It was a party on a plate. I got the idea from “Flavor Matrix” by James Briscione, which I borrowed from the library. The book is based on pairings of foods, determined by a computer based on their molecular similarities. Sound complicated? The book does nothing to simplify matters. And when you do drill down to a nugget of information, many of the pairings seem obvious — citrus with ginger and cilantro, cucumber with yogurt, and winter squash with butter and cheese. Still, I gleaned enough inspiration to come up with this shrimp, coconut and quinoa dish. The author used oatmeal instead of quinoa and the idea does seem novel. Quinoa was another choice, and that’s what I had in the cupboard. If you want to try the oatmeal version, have at it. The proportions of most of the ingredients in the recipe are mine, as are the kabobs. the tropical vibe was just what I needed on a stormy night when I was in the mood to celebrate. Rinse quinoa well under cold running water. Heat butter in a 2-quart saucepan. Sauté onions and garlic until they release their aromas and the onions begin to wilt. Stir in salt. Stir in quinoa. Stir in coconut milk and coconut. Bring to a boil, reduce heat, cover and simmer for 15 minutes. If any liquid remains, uncover and boil until it has evaporated. Remove from heat and fluff with a fork. Mound on two dinner plates and top with kabobs. Note: Frozen, shredded unsweetened coconut can be found in Asian and health-food stores). Note: This makes two to three kabobs per person, depending on appetite. I was fine with two. Tony wanted three. Each kabob has three shrimp. Use your judgement. Soak the skewers in warm water to prevent them from splintering when you skewer the food; even a few minutes helps). Peel the shrimp and pat dry with paper towels. Cut the cheeks off the mango and score the flesh into 1-inch chunks. Cut the chunks away from the skin. Fold the green part of the scallions accordion-style into 1-inch lengths, two bends per piece. In order, thread on a skewer: shrimp, mango, onion, shrimp, mango, shrimp. Repeat with remaining skewers. Heat a large cast-iron grill pan or heavy skillet over medium-high heat. When hot, add oil and swirl to coat pan. In batches, place skewers in pan and sear on one side. Turn and brush seared side with soy sauce. After a minute, turn and brush other side with soy sauce. Turn once more. Shrimp should be done at this point. If not, cook a few seconds longer. Remove from pan and place two or three skewers on top of each mound of coconut quinoa. Serves two. Chicken stir-fry with shredded brussels sprouts over rice; spice-rubbed, wood-smoked spare ribs; tomato meat sauce baked in a spaghetti squash half with Parmesan; coconut quinoa with shrimp and mango kabobs. Spicy fried chicken and green beans with potatoes from Louisiana Famous Fried Chicken in Akron; half of a Subway roast beef sandwich; barbecued pork chops, green beans, salad and hot tea at Alexandri’s in Wadsworth; a cup of vegetable soup and half of a spicy Asian salad with chicken at Panera; a salmon salad from Acme; scrambled eggs with ham and feta cheese, hash browns, wheat toast and coffee at Michael’s A.M. in Akron. I have a question about olive oil. I do understand that olive oil and extra-virgin olive oil have different cooking profiles —extra-virgin (evoo) has a much lower smoking temperature because of higher particulate content, etc. The thing is, 97 percent of recipes call for simply “olive oil,” which to me tastes like vegetable oil with more health benefits. Often I will see a recipe that seems to cry out for evoo, the taste of which I love. I say use evoo when the recipe calls for low-heat cooking and simply olive oil for heavier sautéing. So, my question: Do most recipes calling for olive oil actually mean evoo? Or should it be open to the intended use? Or do we simply use regular olive oil unless a recipe calls for evoo? Those recipes are few and far between. Two issues are germane here. First, many so-called extra-virgin olive oils have been found to not be the first pressing. The olive oil scam erupted in 2015, when testing showed that many Italian olive oils (some say up to two-thirds) were not extra-virgin as the labels claimed. More than 30 producers were arrested after the fraud came to light. To make sure your oil is extra-virgin, consult the list compiled by the North American Olive Oil Association at aboutoliveoil.com. Click on “Certified Quality Seal” in the menu across the top. The second issue is that, in my opinion, many recipe writers use “olive oil” when they often mean “extra-virgin” because that’s the only kind of olive oil most Americans buy. I think you should trust your tastebuds. If you think a recipe would taste better with extra-virgin, use it. The exception, of course, is when the oil is to be heated at a high temperature. That would kill the flavor and produce smoke, so you’re better off using vegetable oil or regular olive oil. I used to buy a very fruity, unfiltered (and expensive) extra-virgin olive oil that I used unheated in things like dressings or to drizzle on a dish as a finishing touch. I got it at West Point Market, and haven’t seen it anywhere else. I think Russ Vernon imported it directly from the producer. For sautéing, I used (and still use) a less-expense jug-type extra-virgin. For frying, I use canola. So basically, I think your instincts are correct. I am not shopping and I’m barely cooking. My life is on hold while I try to meet a writing deadline that’s bearing down on me. I retired to get away from these horrid deadlines. So why am I doing this? To paraphrase Dorothy Parker, I don’t enjoy writing, but I like having written. I am among a group of former Beacon Journal reporters and editors who are writing a history of the Beacon Journal. Former columnist and editor Stuart Warner (now editor in chief of the Phoenix New Times) is editing the book, which will be published by the University of Akron Press. Coming soon (but not too soon) to a book store near you. My chapter is about the newspaper’s food coverage from the 1800s until now. The historical research was interesting, and it has been fun talking to former editors, food writers and restaurant critics. But now I have a mountain of information to organize and whittle down to size. All of this is one big excuse for not creating an original recipe this week. Probably not next week, either. I did cook something new and yummy two weeks ago, though, with this deadline in mind. The dish is a crisp roast chicken that is cut up and doused with a simple but luscious garlic-ginger sauce before serving. The sauce is from Momofuku chef David Chang. He uses it on chicken wings and octopus and calls it “octo vinaigrette.” I suggest making a big jar of it and using it as a dipping sauce for Asian snacks such as egg rolls, skewers and lettuce wraps. It will keep for weeks in the refrigerator. 1 whole broiler-fryer chicken, about 3 lbs. Trim excess fat from chicken and wash it inside and out. Pat dry. Rub the skin with oil and season it with salt and pepper. Place on a rack over a roasting pan and roast at 400 degrees for about 60 to 75 minutes, or until an instant-read thermometer inserted in the thickest part of the thigh not touching the bone reads 170 degrees. Remove from oven and let stand for 15 to 20 minutes before carving. While the chicken roasts, combine remaining ingredients in a jar and shake well. The sauce may be made even earlier — the day before is ideal — as its flavor improves as it sits. After the chicken has rested, cut it into serving pieces, arrange on a platter and splash with about half of the sauce. Pass remaining sauce at the table. Serves 3 to 4. 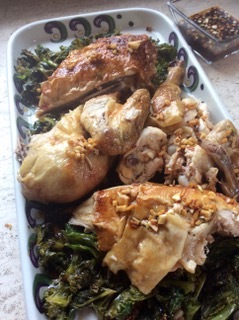 Note: I served the chicken on a bed on stir-fried kale. The sauce dribbled down and flavored the greens. They were delicious. Pumpkin pie; mushroom and potato soup with sherry and wilted spinach; cornbread; sugar-free yellow cake with chocolate-peanut butter icing for Tony’s birthday. Thai chicken skewers, spring vegetable salad from Earth Fare; Indian tomato soup, vegetable pakora, chicken curry, rice, naan at Bombay Grill in Fairlawn; hot tea, tom yum soup with seafood and pan-fried pork dumplings with garlicky dipping sauce (yeow!) at House of Hunan in Fairlawn; fennel-crusted skirt steak over fingerling potatoes, wilted spinach, banana peppers, onions and tomatoes with a glass of red wine at Wise Guys in Akron; a hot dog with Stadium Mustard and onions, peanuts and a beer at Canal Park in Akron at a Rubber Ducks game; two egg rolls from China Star in Akron. Loved your column on Akron-area Chinese restaurants. I have struggled to find tasty Chinese food in our area, also. We were great fans of China Gourmet on West Market Street in Akron before it became a Starbucks. Two questions: Do you have favorite dishes at Chin’s? Can you tell us about your favorite Chinese restaurants in Cleveland? Thanks. OK, those are tough questions because I have a hard time remembering from trip to trip. I know that Elaine Chin’s father, chef-owner until he retired and passed the business to Elaine, was a Cantonese-style dim sum chef in China. So I usually stick with the Cantonese dishes, although I have had good Mongolian beef there. I often order the moo shu pork. In Cleveland, I usually go to Vietnamese restaurants with Tony because he loves pho. I like the dim sum at Li Wah. I wasn’t impressed with ballyhooed Noodlecat (not Chinese but Asian). A restaurant on my radar that I haven’t tried yet is Han Chinese Kabob in Payne Commons. Next trip. You didn’t ask, but I have to put in a plug for Basil Asian Bistro in Canton, which has modern pan-Asian dishes that are delicious. I’d go once a week if it were closer. I have heard people rave about Ming Hing in Orrville. Thanks. Any visitors have an opinion? I just read your latest newsletter and wanted to share a black bean sauce tip from the late, great Barbara Tropp. In her “China Moon” cookbook she suggests soaking the black beans in some xiao xing wine (or dry sherry) for about 20 minutes before adding to the dish. Strain the liquid and save it to add to your sauce ingredients. It really amps up the good flavors and textures of the dish. 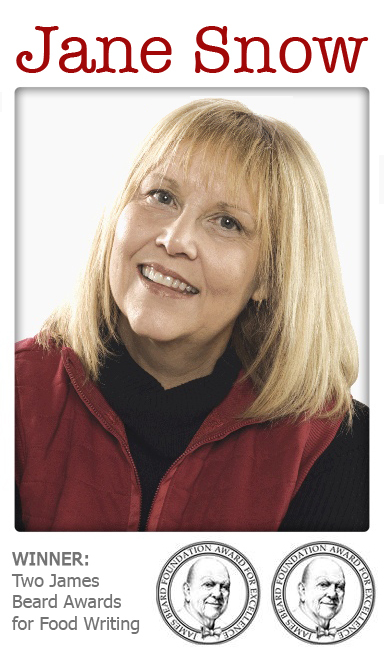 I would trust anything Barbara Tropp says. I actually got to dine at her China Moon restaurant in San Francisco years ago, and I had her cookbook. She was sweet and talented, and I lamented her death in 2001. I remember being blown away by a terrific dessert she made, ginger ice cream with hot fudge sauce. I made it several times. It is time-consuming but so worth it. I am so hungry for Chinese food. And I am so sick of anemic-tasting stir frys a 10-year-old could make with a couple of cans of La Choy and a wok. I need to find a good Chinese restaurant. Chin’s in Highland Square and House of Hunan in Fairlawn are the only places I have found that satisfy, depending on where you land on their menus. Tip: If you see “Bourbon Chicken” on a Chinese menu, it could be a clue the stir frys come frozen from a warehouse in Timbuktu. Bourbon chicken is a staple of Chinese buffet restaurants that buy their stir frys wholesale. Bourbon is American, folks, not Chinese. In an effort to winkle out the decent homemade dishes on a multi-page Chinese restaurant menu, I ask the waitress which dish is the cook’s specialty. I don’t know why I do this because the answer invariably is “everything is good” or a finger pointed to a list headlined “Chef’s Specialties” that cover every region of China and are the most expensive items on the menu. Is there a real chef in the kitchen at any of these restaurants? Maybe he or she makes something good for their families and friends, while saving the trite moo goo gai pans for their American customers. In my reporter years, I once tried to find out if this was true. I interviewed Chinese restaurant chefs all over the area to determine their provinces of origin and get recipes for dishes they make at home. Only a couple (at Chin’s and House of Hunan, in fact) were chefs before they emigrated. The rest decided to open a restaurant and wing it after they got here. Anyway, if I want to eat Chinese I must travel from Copley to Highland Square or dress up (i.e, change out of pajamas or a track suit) and go to House of Hunan or drive to Cleveland. A fourth alternative is to make some Chinese food myself, which I did last week after I tossed out a pitiful version of chicken in black bean sauce from a Norton Chinese restaurant. “How hard can it be to make this?” I wondered. Not hard, it turns out. The most difficult part is finding the fermented black beans. Unless you have an unruly pantry like mine, it will require a trip to an Asian store. In Irene Kuo’s excellent book, “The Key to Chinese Cooking,” the recipe for the sauce is ridiculously simple: soy sauce, sherry, sugar and water. The black beans are stir fried with the chicken, ginger, garlic and vegetables. The sauce is thickened with a cornstarch slurry and finished with a swirl of sesame oil. The result is a tawny, glazed stir fry with tons of flavor. Kuo starts with a whole chicken that she hacks, bones and all, into 1-inch pieces. I used bone-in thighs instead but next time will opt for boneless because we didn’t like eating around all the slivers of bone. Your choice. Cut the chicken or bone-in thighs through the bones into 1-inch pieces. Or cut the boneless thighs into similar-size pieces. Place in a bowl and line up near the stove with the onions, peppers, ginger, black beans and garlic, all in separate piles. Mix the seasonings. Dissolve the cornstarch in a small bowl; have the sesame oil nearby. All this may be done hours ahead of time. 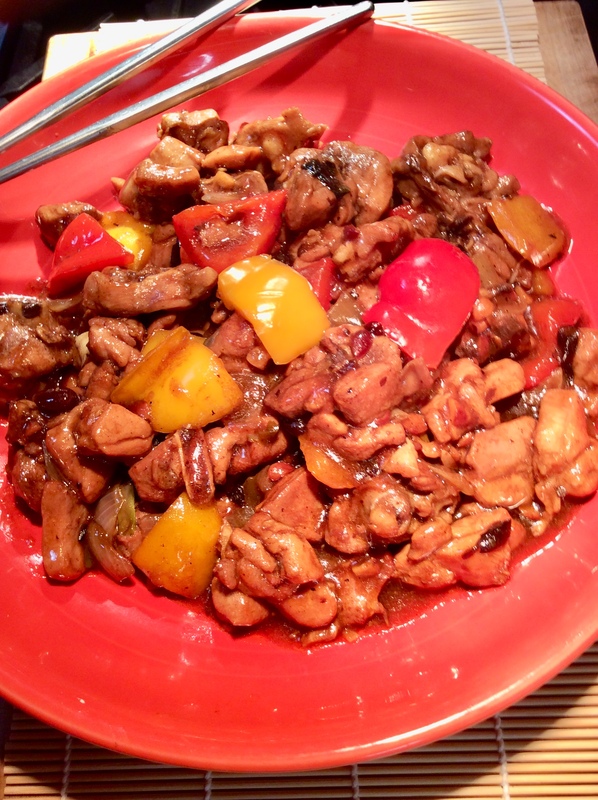 Cover and refrigerate the chicken and vegetables, then bring to room temperature before stir frying. Heat a large, heavy skillet over high heat until hot. Add 2 tablespoons of the oil, swirl and heat for 30 seconds. Scatter in the onions and peppers and stir fry vigorously with the salt until they are just beginning to lose their raw edge. Remove to a dish. Add the remaining 2 tablespoons oil to the pan, heat a few seconds, and sear the ginger, black beans and garlic for a few seconds, stirring all the time. Add the chicken and toss and stir until all the pieces are yellow-whitish. Add the seasonings mixture, stir and when it bubbles, turn heat to medium, cover and let the chicken steam-cook vigorously for 10 minutes, stirring occasionally. Uncover, turn the heat to high, add the onions and bell pepper and stir in sweeping, tossing motions for 1 minute. Give the cornstarch mixture a big stir and pour into the pan, stirring until the chicken and vegetables are smoothly glazed. If the sauce is too thin, quickly make and add more cornstarch slurry. Add the sesame oil, give the contents a few sweeping folds and pour into a hot serving dish. Makes 4 servings. From “The Key to Chinese Cooking” by Irene Kuo. Note from Jane: If you don’t cook the stir fry at a high enough heat, which can be a problem with home stoves and fear of spatters, the chicken will release so much moisture that the sauce will require at least double the thickening. A detox green smoothie; chicken in black bean sauce, steamed rice; hamburgers; roast chicken with ginger-garlic sauce; DiGiorno’s frozen pizza. Half a meatball sub from Subway; bacon-wrapped meat loaf, roasted carrots, mashed potatoes and a glass of Malbec wine at Wolf Creek Tavern in Norton; a hot Italian sub at Primo’s Deli. In response to your question about foods we once disliked….I will be 60 years old in June. About three months ago I started eating cottage cheese for the first time in my life. I could never stand the texture before, I guess. Now I eat it almost daily, especially since I’ve discovered Hood’s brand. Next up I will be attempting to make my own as I do ricotta — can’t beat homemade! When I was pregnant with my first child we had feta cheese in a salad at a Greek festival and it was AWFUL! So I never ate it for years. One day I had a Greek salad and just knew I did not like feta cheese but took a bite anyway. Then I realized how much I LOVED it! Probably pregnancy gave me funky tastebuds for feta. It tastes so good and I enjoy it every time I have a Greek salad. How interesting that you both once disliked a particular cheese. I can’t think of a cheese I dislike, although there’s probably one somewhere that I’d turn up my nose at. I eat cottage cheese several times a week because it’s a good source of lean protein and I like it. Feta may be my favorite everyday cheese. It is relatively low in fat and has a mild but distinct salty flavor. I use it in tacos, all kinds of salads, omelets and even on pizza. Very few foods are on my hate list. Among them are natto — slimy Japanese fermented soybeans — and tripe, which I’ve tried to like but whose texture puts me off. I’m not trying to pick a fight with the food police of Bologna, Italy. It’s just that both Marcella Hazan and my husband disagree with them. In 1982, a food society in Bologna published a recipe its members, after much study, declared was the last word on ragu alla Bolognese — meat sauce for pasta, which is thought to have originated in the city (hence, “spaghetti Bolognese” ). I have made Bolognese sauce but not the official one until last week. It contained just two tablespoons of tomato paste and no tomatoes. When the sauce was an hour into its two-hour simmer, I caved and added a cup of crushed tomatoes. I knew Tony wouldn’t like a spaghetti sauce with no tomatoes. Before I added the tomatoes, the sauce tasted good but not as good as Hazan’s, which I use for lasagna with homemade noodles (it’s like eating heaven). Even Hazan, a cookbook author and the premier northern Italian food expert, adds tomatoes to Bolognese sauce. The finished sauce tastes more of meat and cream, but the tomato notes are there. Bolognese sauce, both the official and unofficial versions, is almost all meat, no liquid. The wine, seasonings, milk and cream are absorbed into the ground meat, giving it an unctuousness and depth of flavor regular spaghetti meat sauces lack. A meaty, almost sauceless sauce is just what I needed for baked spaghetti squash alla Bolognese. 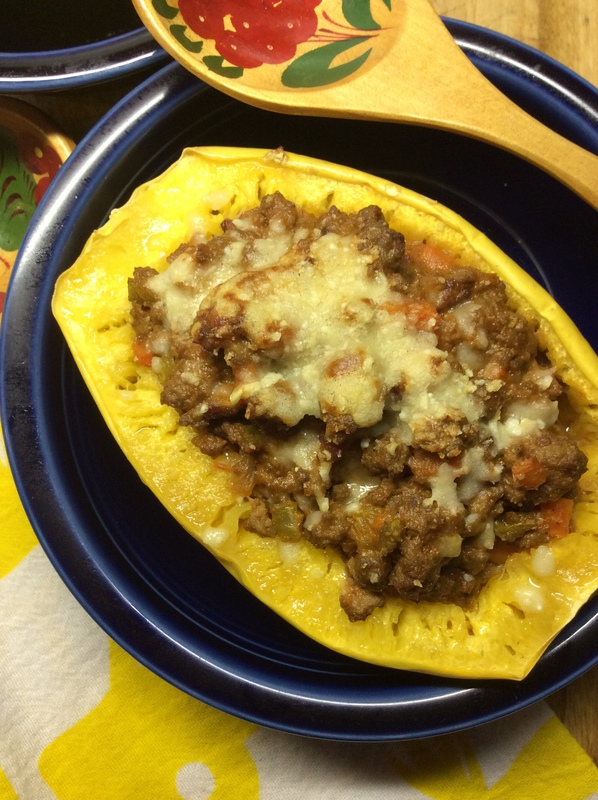 The stringy squash is halved and filled with meat sauce, then topped with Parmesan cheese and baked. As you eat, your fork rakes up the strands of squash and drags them through the sauce. It is a memorable way to eat both squash and sauce. I have wanted to make this dish since Julie Maier-Miller of Claire’s Garden in Norton posted a photo of her creation on Facebook. The idea is hers. The recipe I’m sharing is my version. If you want Julie’s version, you should sign up for one of her cooking classes. Information follows. I am sharing two recipes for the sauce: my modified sauce from the food fathers of Bologna, and Marcella Hazan’s sauce. Take your pick. I baked the sauce in single serving-size spaghetti squash I found at Aldi’s. The more typical, larger spaghetti squash would probably serve three or four. The recipe makes enough to fill two or three squash. I filled two halves and Tony used the rest on angel hair pasta. The sauce freezes beautifully if you prefer to save the leftovers for more baked spaghetti squash. This is the best way to eat spaghetti squash I’ve come across. Filling the cavity with sauce and baking it is a brilliant idea. Thanks, Julie. Cut squash in half lengthwise. Scoop out and discard the seeds and their membranes. Working with two halves at a time, place cut-sides down on a microwave-safe plate and microwave on high power for 8 to 15 minutes, depending on the size of the squash. When done, the squash will be tender enough to pierce with a fork but the shell will still be firm. Set aside. Make Bolognese sauce. Almost all of the liquid should evaporate, leaving just the creamy meat. Place the squash halves, cut sides up, in shallow oven-proof bowls and place on a baking sheet. Or place the squash directly on a baking sheet. Brush the rims of the squash with oil or melted butter. Mound the sauce in the cavity of each squash half. Sprinkle each with 2 or 3 tablespoons Parmesan cheese. Bake at 400 degrees for 30 minutes, until the cheese has melted and the squash is completely tender. Serve in individual bowls or on dinner plates. Makes about 6 servings. Heat 1 tablespoon olive oil in a heavy-bottomed medium pot, preferably terra cotta or ceramic-clad cast iron. The pot should be deep so the sauce doesn’t reduce too rapidly. Add pancetta and cook over medium heat, stirring occasionally, until the pancetta’s fat has rendered, about 10 minutes. Add another 1 tablespoon olive oil and the celery, carrot and onion. Cook, stirring frequently, until soft and lightly browned, about 15 minutes. Increase heat to medium-high. Add the ground meat and cook, stirring occasionally, until broken up and lightly browned and beginning to sizzle. Add the wine and cook until evaporated, about 4 minutes. In a small bowl, stir together the tomato paste and 3 tablespoons water. Add to the pot and stir well to combine. Reduce the heat to low and simmer the sauce, stirring occasionally, and add the milk little by little until all the milk is added, about 1 hour. Season with salt and pepper. Add the crushed tomatoes and simmer 1 hour longer, stirring occasionally, until the sauce is very thick. Stir in the cream and nutmeg. Mound in the squash per above instructions or toss with freshly made tagliatelle — never dry pasta. Use an earthenware pot if possible; if not, a heavy, enameled cast-iron casserole, the deepest one you have (to keep the ragu from reducing too quickly). Put in the chopped onion, with all the oil and butter, and sauté briefly over medium heat until just translucent. Add the celery and carrot and cook gently for 2 minutes. Add the ground beef, crumbling it in the pot with a fork. Add 1 teaspoon salt, stir and cook only until the meat has lost its raw red color. Add the wine, turn the heat up to medium-high, and cook, stirring occasionally, until all the wine has evaporated. When the milk has evaporated, add the tomatoes and stir well. When the tomatoes have started to bubble, turn the heat down until the sauce cooks at the laziest simmer, just an occasional bubble. Cook uncovered for a minimum of 3 1/2 to 4 hours, stirring occasionally. Taste and correct for salt. Ragu can be kept in the refrigerator for up to 5 days, or frozen. Reheat until it simmers for about 15 minutes before using. Jullie-Maier Miller, whose Facebook post was the inspiration for my stuffed spaghetti squash recipe, will soon begin offering cooking classes in response to requests from her friends. Miller’s style of cooking is low-carb with a Paleo bent, but she is not a purist. She uses dairy products and whatever her nutrition research tells her will make a body feel good. “It’s a healthier diet you can adapt to you,” Miller says. The small classes (BYO wine) will be held in her Barberton Air B&B. Miller, a former banquet chef, is a florist at Claire’s Garden in Norton. She says that all day, while working at her shop, she thinks about what she is going to cook that night. She plans to teach recipes and techniques for all skill levels. For more information or to sign up for a class, phone Miller at the florist shop at 330-835-6922 or email clairesgardenflorist@gmail.com. Detox green smoothie; pan-grilled salmon with capers and lime beurre blanc over wilted spinach with toasted garlic and slivered almonds; over-hard eggs on toast with ketchup; sirloin steak salad with pan-seared brussels sprouts, sautéed mushrooms, red bell pepper, toasted slivered almonds and shaved Parmesan; Bolognese meat sauce baked in spaghetti squash; chocolate pudding; sugar-free strawberry Jell-O. Hamburger, potato chips and cabbage soup at Alexandri’s in Wadsworth; pepperoni pizza from Rizzi’s in Copley; wonton soup, egg roll and stir fried chicken in black bean sauce at Ming Garden in Norton (another intolerable “Chinese” meal; is it that hard to make a decent stir fry sauce? ); tacos al pastore and a taco with Korean barbecued pork belly (fabulous!) at Funky Truckeria in Norton; refried beans, a green chili beef burrito (meh) and freshly made tortilla chips (great) and salsa at Casa del Rio in Wadsworth. Regarding your smoothies, Robek’s has extensive healthy green smoothie options, many with calorie counts the same or less than your Detox Island Green smoothie, and one that has nearly identical ingredients. Check the Low Calorie, Superfood and Wellness selections. I like the cool cucumber fresh juice. I ask them to put it over ice, or blend it with ice to make a smoothie. Anyway, Robek’s has changed its menu quite a bit since it first opened. Well, yes and no. The menu does have more healthful options than the (essentially) milkshakes it started with. But I’m disappointed that most of the smoothies still are made with sherbet or frozen yogurt, and even the low-cal, wellness and superfood selections are high in sugar. 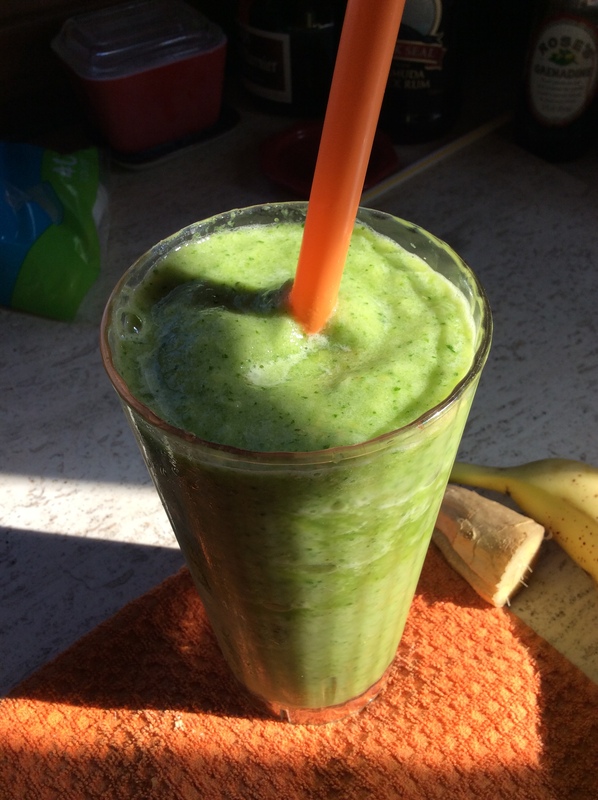 The green smoothie you mentioned sounds good until you get to the apple juice. The one I tried was so sweet I couldn’t finish it. The spoiler for me is that the calories are much higher than Tropical Smoothie’s Detox, which has just 180 in a 24-ounce portion. Robek’s Queen of All Greens, made with banana, pineapple, spinach, kale and apple juice, has 180 calories for a small, which is 12 ounces. Double that for a 24-ounce smoothie and you have a meal-sized 360 calories. Sigh. I am sure there are lots of ways to fix grits, but this is what we do. Add some crumbled bacon or bacon bits and a slice of cheese. The heat of the grits melts the cheese. Then a pat of butter on top, salt and pepper — fit for a king (or at least a prince). Oh, yeah. Sign me up. As the road to Ohio unspools, carrying me from summer to early spring (I will reach Copley Thursday or Friday), I am thinking of all the good food I’ve had in Florida. I ate stone crab claws, grilled tilefish, oysters on the half shell, shrimp and grits, conch ceviche, cioppino, Cuban sandwiches, empanadas, pork barbecue, Caribbean coconut roll and a citrusy coconut chickpea soup. On the flip side, I also had way too many McDonald’s hamburgers (while using the wi-fi there), some bad pizza, Tony’s spaghetti with red sauce, and several nights of cottage cheese for dinner. Oddly, marrying a chef seems to have lowered my food game. We don’t dine at many contemporary-cuisine restaurants. That’s because Tony is Japanese, and Japan still adores the American foods of the 1950s. Sushi and ramen aren’t served at home. The real Japan dotes on Miracle Whip, Sanka and Ritz crackers. Anyway, I look forward to cooking on my 5-burner stove and using my blender and food processor. I look forward to having more than one square foot of kitchen counter space. I especially look forward to making my favorite cool-weather dishes as winter segues into spring. The bare bones of the following recipe is from Craig Claiborne of the New York Times. Sprinkle the chicken pieces liberally with salt and pepper. Sprinkle with flour. Heat the butter and oil in a skillet. Add the chicken pieces skin side down. Cook over medium-high heat until lightly browned. Turn and brown the other side. Scatter the onion over all, stir and cook 30 seconds. Add the garlic and stir. Cook until the onion begins to soften. Add the wine, water, bay leaf and thyme. Bring to a boil, reduce heat, cover and simmer for about 20 minutes, until the chicken is cooked through. Stir in the sour cream and heat but do not bring to a boil. Makes 4 servings. Dried fava beans. I found them (labeled “broad beans”) in the Spanish section of a Walmart. Do they make me feel more cheerful? Maybe a little. A dark-rum cake from Edible Spirits in Stuart (THAT made me cheerful); a Detox Green Island smoothie from Tropical Smoothie Cafe in Stuart; pulled pork sandwich from Sonny’s Bar-B-Que; another Detox smoothie from Tropical Smoothie Cafe (I’m obsessed); a gyoza, one fried shrimp, Mongolian beef, a chunk of fresh pineapple and two deep-fried sugar dough balls at Sakura Japanese Buffet in Stuart; a McDonald’s hamburger; scrambled eggs, grits, toast, ham and coffee at Pogie’s in Okeechobee; a chef’s salad from The Diner in Fort Pierce; a fabulous, crunchy, lush shrimp po’ boy at Good Spirits in Okeechobee; a McDonald’s Egg McMuffin and coffee. Thanks, Jane, for the great article on “use by” dates. Everyone thought I was crazy, cheap, etc. because I went by taste and smell. I’ve kept salad dressing long after the date — again, I taste it and decide. I always keep milk in the back of the fridge and it goes way beyond the use date. Flour I keep in the fridge and so far I’ve never had a problem. My yeast is 2 years old. I keep it in the freezer and it bubbles up perfectly. I need to try the Italian wedding soup at Vaccaro’s (from last week’s newsletter). So far, Yocono’s is still my favorite wedding soup. I haven’t had Yocono’s wedding soup but I’ll try it if anyone has recipe. We keep our spices in the door of the top freezer in our fridge. The extras are in plastic containers on the shelves. My husband alphabetized them and taped labels on the shelves and containers. I pretty much know where they are, so that I can grab them quickly when I open the door, minimizing the warm air entering the freezer. They last a lot longer that way. I also tape labels, indicating the purchase date, to the jars after I bring them home from the store. I once kept bay eaves that way for several years and they were fine. I know we’re a bit obsessive, but it saves a lot of money in the long run. Any way you can prolong the life of herbs and spices is a good thing because they are so expensive. I buy what I can in ethnic food stores, where prices are much lower than in supermarkets. The quality isn’t as good, of course, which is why I treasure the Penzey’s 4-pack of cinnamon, ginger and nutmeg a generous friend gave me as a hostess gift. I plan to invite her to dinner a lot more often. Go tropical. That has long been my culinary answer to suffering through the tail end of winter. One year I made a big platter of black beans and rice topped with Cuban roast pork and mango salsa. Another year I cranked up Beach Boys music and served white sangrias and coconut shrimp. Last weekend I craved the sweet-savory flavor of coconut shrimp but didn’t want the mess of frying just before packing up the camper to head North into winter, so I invented coconut shrimp tacos. I think. I’m tired of Googling my recipe ideas to find someone in Timbuktu has already thought of it, so I’m just going with the notion that this is original. Certainly, the recipe is. My tacos taste like coconut shrimp but without the batter and mess of deep frying. To mimic the flavor I sprinkled lightly toasted coconut over mojo-flavored shrimp in freshly warmed taco shells. I topped the tacos with a simple mango salsa for an extra tropical punch. They really do taste like coconut shrimp. The tacos are substantial. Tony could eat just four. I layered my share of the filling on romaine leaves instead of taco shells but still could eat just three. They made me feel sunny and happy. Now comes the trek North. Heat a large nonstick or cast iron skillet over medium-high heat. Scatter coconut in the dry skillet and toast, stirring, until patches just begin to lightly brown. The coconut should be half toasted but still moist, not crunchy. Remove from heat and scrape into a small bowl. Set aside. In a medium bowl, combine mango, jicama, sweet onion, the 1 teaspoon olive oil, lime juice and salt and mix well. Set aside. Wipe out the skillet and return to medium-high heat. Toast the tortillas one at a time in the dry skillet, turning when brown spots begin to appear on one side. Toast the other side and fold in half with tongs. Don’t toast too long or the tortilla will become too crisp to fold. Transfer to a platter. Heat the one tablespoon oil in the same skillet over high heat. Pat the shrimp dry with paper towels and place in skillet. Cook briefly, stirring (30 seconds to 1 minute). When shrimp are almost cooked through, add mojo marinade and stir for 30 seconds. Remove from heat. To assemble, place 3 or 4 shrimp in each taco shell or romaine lettuce leaf. Sprinkle each with about 2 teaspoons toasted coconut. Top with the salsa and garnish with the minced green onion, if desired. Makes 10 substantial tacos. If you get caught up in the Konmari cleaning method that’s sweeping the country, please don’t tear through your kitchen cabinets and refrigerator, tossing out everything beyond its expiration date. Your 1980s suits with the big shoulder pads have an expiration date. Your saffron does not. I, too, have caught the Konmari bug (named after Marie Kondo, author of “The Life- Changing Magic of Tidying Up”) and plan to pillage my closets, pantry and spice cabinet the minute I return home from Florida. But I will not discard food just because of an arbitrary expiration date, and neither should you. The “best if used by” dates on food packages do not indicate you will die or become ill if you consume the food after that time. In most cases the expiration date has nothing to do with food safety. It is merely a suggestion that the quality may begin to decline after that date. Vitamins may begin to fade or the texture may be a bit wonky or the color may not be as true. But you will not die if you eat it. Your nose, eyes and common sense are the best indicators of when it is time to discard a food. That’s because how carefully you store a food plays a big role in how long it will “last.” For example, foods that are frozen in their store packaging will get freezer burn and develop an off taste far sooner than foods that are double- or triple-wrapped at home before freezing. never, ever spoil. It may not taste great five years later, but it will be safe to eat. Another example: Milk may turn sour in a matter of days or remain fresh for a couple of weeks or more depending on how it is handled. If you stop on the way home from the store on a warm day, the heat will shorten the shelf life of the milk in the back seat. If you leave the milk on the kitchen table for 30 minutes while enjoying your morning coffee, the lifespan of the milk is shortened. Even if the milk is rushed home and returned to the refrigerator after each use, but is stored at the front of a shelf near the door, the frequent exposure to room-temperature air will shorten its life (although not as much). I once bought more milk than I could use in a week and kept the extra half-gallon at the back of the refrigerator, out of the way. When I opened it two weeks later, it smelled and tasted as fresh as just-bought milk. The lesson is to rely on your nose and tastebuds. Does it smell fresh? Does it taste fresh? Then use it. This is especially true when it comes to herbs and spices. I can’t wait to tackle my overflowing spice cabinet when I return home, but I won’t so much as glance at “use by” dates or look up longevity info on the Internet. I will toss out the rosemary that is so old it has faded to gray, and the ground cardamom that no longer smells pungent. But I will keep the old bottle of “chili powder” (that mix of ground chilies, cumin and whatnot popular in Northern states) because you never know when a recipe will call for it, and I’ll be damned if I’ll buy another jar of a spice I disdain for a mere teaspoon in a misguided recipe I’m testing. I will discard dried herbs when they no longer smell like the herb. If they have faded in pungency just a bit, I will keep them and merely add more than is called for. I will never throw out whole spices such as nutmeg, cloves and cumin seeds. They retain their pungency far longer than ground spices. For years, in fact. Some foods defy the sniff and taste test, and live by different rules. Old baking powder and old flour do not perform as well as fresh, so you might want to toss them at their expiration dates. Then again, you may not want to buy a new bag of self-rising flour for the occasional Southern biscuit recipe, and like me, you’re prepared to take your chances. Just remember it’s your choice, not the food manufacturer’s. 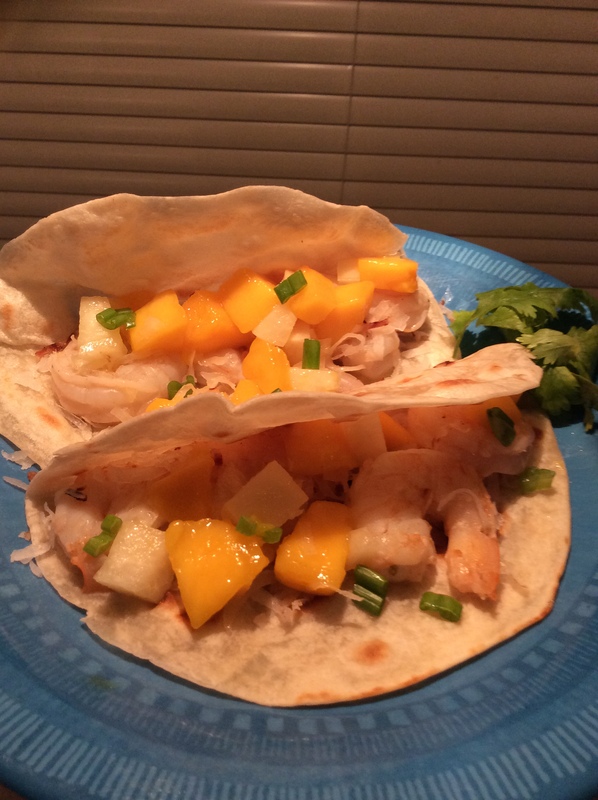 Surrollos; coconut shrimp tacos with mango-jicama salsa. Cheeseburger from McDonald’s; tacos al pastor, chorizo and asada with onions, cilantro and lime, and rice and beans from the Taqueria La Unica food truck in Okeechobee; a yogurt parfait from McDonald’s; Thai beef salad at Noodle World in Stuart, Fla.; a Detox Green Island smoothie from Tropical Smoothie Cafe in Palm City; a Cobb salad with shrimp at Parrott Island Grill in Okeechobee; a chicken empanada and half of a Cubanado empanada (filled with Cuban sandwich ingredients) and a cafe con leche at Mervis’ Cafe in Fort Pierce; a Detox smoothie at Tropical Smoothie Cafe in Cocoa Beach; a seasoned hamburger patty, cottage cheese and lots of fruit at Pogie’s in Okeechobee; half of a meatball sub from Subway. Oh, Dobie’s Corner! My husband and I frequented the place (mentioned last week) so very often. In fact, when George (Dobrin) closed the place he returned the restaurant sign to the wood carver, a friend of ours, who made it for him. Our friend gave it to us because he knew how much we liked that restaurant. The sign found a good home. It’s now on the entry way to our dining room. Maybe I’ll hit my husband up to make mititay (those delicious fingers of meat) this weekend, if I make polenta to accompany them. Thanks, Jane, for the memories. I loved the tiny Bath restaurant, too, especially the soups. I still make several of them, including potato and greens and Roquefort and cabbage. Dobie’s was the first place I encountered polenta and it was love at first bite. At Dobie’s it was called by its Romanian name, “mamaliga,” as I’m sure you remember. I made your Italian wedding soup for a wine pairing dinner party last week and it was a huge hit. 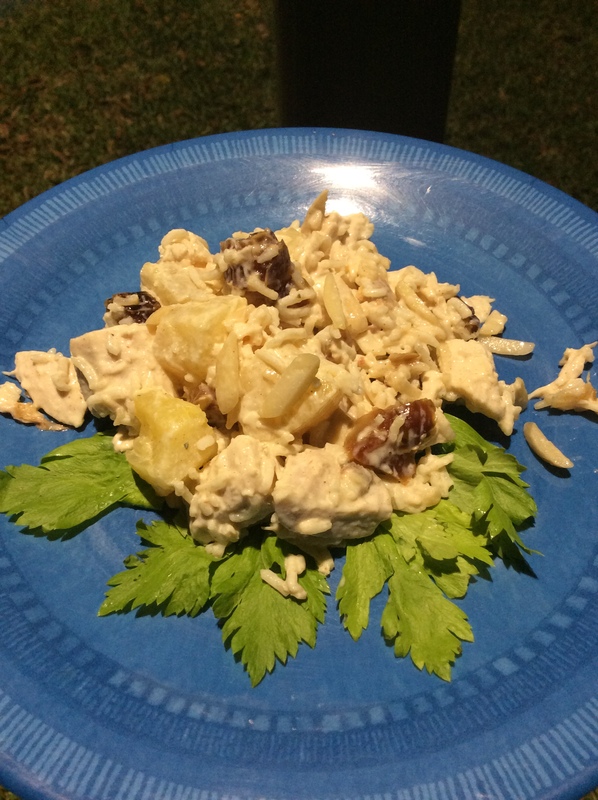 Maybe you could share the recipe with your readers it is the best. The recipe is the best one I’ve seen for wedding soup, too. Raphael Vaccaro of Vaccaro’s Trattoria in Bath shared his treasured family recipe for a story I wrote in 2001. Gently mix together veal or chuck and pork. Add eggs, pepper, salt, cheese and parsley and mix lightly but well. Gently work in enough seasoned bread crumbs to make a firm mixture. Roll into meat balls the size of grapes. Place on baking sheets with sides and bake at 350 degrees for 10 to 12 minutes. Meatballs may be cooled, then frozen. Use directly from the freezer. Measure all ingredients and place them in bowls on the counter, in the order they will be used. Bring broth to a simmer in a large soup pot. Add carrots, celery, onions, endive and spinach. Add the meatballs. Simmer uncovered for about 30 minutes, until carrots are tender. In a medium bowl, combine cheese and egg and mix well. Scrape mixture in a lump into the center of the simmering soup. Let simmer for 2 to 3 minutes without stirring. Lift the mass occasionally with a slotted spoon to keep it from sticking to the bottom of the pan. The soup is done when the egg-cheese mixture looks firm. Gently break apart with a spoon. Remove soup from heat. Stir in the pasta. Season to taste with freshly ground pepper. Serve hot. In the book, Willa’s historic old house is splitting apart at the seams. The upstairs bedrooms, wet and cold, are abandoned for a bed of quilts on the living room floor. The gas had been turned off and any cooking that is done takes place on a camp stove.The cupboards were practically bare when Jorge, her daughter Tig’s boyfriend, decided to make something from nothing for dinner. He scrounged up cornmeal, sugar and a nubbin of cheese that he asked Willa to grate. “He was stirring cornmeal into the boiling water in a meditative way, thickening it into a yellow batter. Tig lit the other camp stove burner and heated oil in a skillet. Jorge took Willa’s plate of cheese and stirred it into his batter…. “He held out a plate of golden corn fritters….Willa took a bite and held it between her front teeth until it cooled enough to taste: crisp on the outside, sweet and melty in the middle. She made an appreciative noise with her mouth full. Recipe sites call them variously surollos, sorullitos and surullitos, but the technique is the same: Stir salt, sugar and corn meal into water, add grated cheese, shape into stubby cigars and fry in oil. Few ingredients and no hassle, which is what I’m in the mood for right now. Bring water to boil in a medium pot over medium-high heat. Add salt and sugar. Slowly whisk in cornmeal. Reduce heat to low. Cook, whisking constantly, until water is absorbed and dough pulls away from pot, 3 to 5 minutes. Remove from heat. Stir in cheese and continue stirring until completely melted and incorporated. When cool enough to handle, scoop up chunks and roll into finger-length cigars tapered at each end. Heat 1½ inches of oil in a deep skillet over medium-high heat.The temperature should be 350 degrees on a deep-fry thermometer if you’re measuring. I just dropped in a dab of the cornmeal stuff and made sure the oil bubbled frantically around it. Fry in batches until golden and crisp, 3 to 4 minutes. 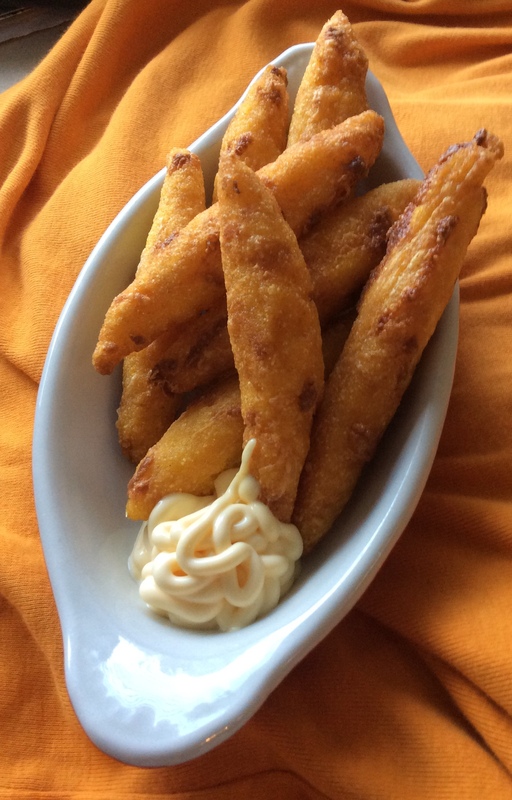 Drain on paper towels and serve hot with garlic mayonnaise or ketchup mayonnaise for dipping. Combine ingredients, cover and chill until the garlic flavors the mayonnaise. Or eat immediately if you can’t wait. Blue cheese burgers on buns, corn kernels and diced avocado in vinaigrette, a bloody Mary. A few bites of spaghetti with meat sauce and a piece of chocolate cake at the Shriner’s hall in Okeechobee; a piece of cornbread at Pogey’s in Okeechobee; a ham, egg and cheese sandwich on an everything bagel at Dunkin’ Donuts; raw oysters, conch ceviche, grilled tilefish, slaw and a hush puppy at Lightsey’s Fish Co. in Okeechobee; a Quarter Pounder and a few fries at McDonald’s; a chicken empanada, ham croquetta and a roast pork sandwich from Lazz’s Cuban Cafe food truck in Okeechobee; an egg roll and a few bites of “Hunan chicken” from Bucio, a Chinese food truck run by a Mexican family (and it tasted like it) in Okeechobee. What I miss most at Lou & Hy’s is the Macadamia Nut Cream Pie. By any chance did Tage (the chef) give you this recipe? Do any of your readers have the recipe? That pie was one of the most popular items at the old Akron delicatessen. I never got the recipe, but Beacon Journal readers asked so often that we found versions that were close, such as this one from Evie Dobrin, owner with her husband, George, of Dobie’s Corners restaurant in Bath. It ran in the newspaper in 2002. Whole macadamia nuts for garnish Prepare and cool pie shell. Beat sugar, cornstarch, salt and egg yolks in a small bowl until well mixed. Heat milk in a medium saucepan just to a simmer. Stir sugar mixture into hot milk, whisking rapidly. Cook, stirring constantly, until mixture thickens, about three minutes. Do not boil. Remove from heat and stir in butter. Cover with waxed paper and chill. Beat one-half cup of the heavy cream until stiff; fold into cooled custard with coffee liqueur and all but one tablespoon of chopped nuts. Spoon into pastry shell. Chill several hours or overnight. Whip remaining cream. Spread over pie. Sprinkle with reserved nuts. Although the thermometer says “summer” here in Florida (the temps are in the 80s this week), the produce says “winter.” Root vegetables are plentiful. Everything else, not so much. I did get a watermelon that turned out to be from Guatemala and cost $7.50, I discovered at the cash register. Strawberries from Plant City and citrus fruit from nearby groves are in season, but most tender vegetables are not. The tomatoes I find at vegetable markets are as hard and tasteless as those in Ohio supermarkets at this time of year. Maybe that’s due to the type of tomato planted here — thick-walled for bruise-free transport. Which is why I served carrots last week with my very summery meal of steamed stone crab claws with melted butter. The crab claws, plucked from the water, quick frozen and bought not a half-mile from the source in Everglades City, tasted like the ocean. The carrots managed to taste summery, too, thanks to a high-voltage lemon dressing. I used equal parts olive oil and fresh-squeezed lemon juice. I cut the carrots into batons and cooked them briefly in a lidded skillet with a bit of butter and salt. 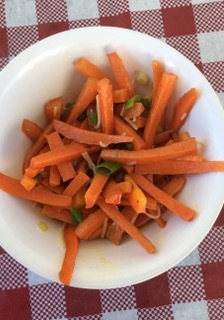 Most carrot salads feature raw carrots, but I think the vegetable tastes best when heat transforms the starches to sugars. Why butter and not olive oil? Because everything tastes better with butter. I tossed the carrots with the dressing, sliced green onions and grated Parmesan and chilled. The salad was simple but so good I’ll be making it often, no matter what the weather. Place carrots and butter in a skillet over medium-high heat. When butter melts, swirl to coat the carrots and skillet and sprinkle with salt. Cover and cook 4 to 5 minutes, until almost soft. Transfer to a bowl and toss with green onions, olive oil, lemon juice and Parmesan cheese. Chill. Makes 4 servings. Savory chorizo and corn bread pudding in the slow cooker (I burnt it); carrot salad with lemon dressing, steamed stone crab claws with melted butter. Seasoned hamburger patty, cottage cheese, lots of fruit at Pogey’s in Okeechobee; strips of grilled sirloin steak, grilled onions and bell peppers and a bite of refried beans at Pueblo Viejo in Okeechobee; half a ham and provolone sub from Subway; spaghetti with meat sauce, salad, Italian bread and homemade white cake with delicious dripping icing at the Okeechobee Shriners Hall ($8 including karaoke! ); a heart-shaped Bavarian doughnut dusted with powdered sugar at Dunkin’ Donuts (my Valentine’s treat); a Cuban sandwich and plantain chips from Mervis’ in Ft. Pierce; a spinach, banana, mango and ginger smoothie at the Tropical Smoothie Cafe in Port St. Lucie; an Indian taco (chili, lettuce, tomato and shredded cheese on fry bread) and a frozen chocolate banana at the Seminole Indian Field Day and Rodeo in Brighton; pulled pork, roast beef, corn bread, lima beans, a brussels sprout, a dab of mashed potatoes and a sugar-free chocolate cookie at Golden Corral in Okeechobee. I am a native Clevelander living in Las Vegas. We moved here a little over a year ago, but before that we lived in Jupiter, Fla., for 14 years. You are so right about there not being any local fresh fish markets. The best way to get fresh fish is to make friends with someone who has a boat! If you ever take a ride to Jupiter, one of my favorite restaurants was the Galley Grill Also a great Cuban restaurant is Copacabana. In Palm Gardens, there a Mediterranean restaurant called Aladdin where you can get a gyro lunch special for $9.99. I wish I could find something that compares here in Vegas! I have had some awesome food in Vegas, including tins of fresh caviar served on a tavern-sized bar made of ice. Ah, the good old days of expense accounts. Sorry I can’t return the favor with great, reasonably priced Vegas suggestions. I am so glad you wrote, though. I will try some of your Florida favorites. We have already been to Jupiter once and now we will go back. What’s up with the lack of fish markets? Two other people who live here wrote, agreeing with us on that score. Regarding peeling garlic, tell your readers to put a clove or two in the microwave for 5 to 10 seconds, depending on the size. The peel will come right off. I think I learned this trick in a microwave class years and years ago. Occasionally the clove will pop and get hot, but put a knife through the end of the clove and the skin comes right off. Never heard of this. I tried it and it works! My usual method is to just smash the cloves with the flat side of a knife. That works, too. I just read your recent newsletter and I highly recommend the garlic peeler from Pampered Chef. To me it was worth the dollars. It’s a rubber tube, open on both ends. Drop the cloves in the tube, roll it on a flat surface or between your hands, and skins come right off. The other part of the peeler is a gadget that slices the garlic once peeled. I hated what I paid for it, but for me, who has horrible arthritis in my fingers, it was worth it. Donna G.also recommended this gadget, which costs $22 to $26, according to various websites. That IS steep for a little rubber tube, but I just may buy one. Can anyone think of a hardware-store alternative? I have had a taste for cheesecake lately. I now live in new Jersey not far from New York City. While I have eaten many different types of cheesecake here, nothing is as good as Lou & Hy’s…in particular, the chocolate cheesecake. My mom gave me a printout that appeared in a blog by the Summit County Historical Society dated 2-16-13 with a recipe referencing you as the source from an Akron Beacon Journal article on 10-15-03 with a recipe for the plain cheesecake. I tried making it and I also added some Baker’s chocolate another time for a chocolate version. It was good, but the cake wasn’t as dense as I remember. I think the whipping cream was too loose as the cake is a little too loose even after refrigeration. The recipe didn’t specify it but I added the confectioners’ sugar to the whipping cream. I baked it in a water bath but the top still cracked. I was using a 10-inch springform pan and I baked it at 325 degrees for about an hour. Do you recall this article? I’m wondering if you have any updates on the recipe that was originally posted. The former chef of Lou & Hy’s gave me the recipe after he retired and that’s the one I printed in 2003. It makes way more than one cheesecake. I cut down the recipe for my cookbook, “Jane Snow Cooks,” but unfortunately I did not bring a copy with me to Florida and the digital copy is on a computer at home. I do know that the cheesecake is baked for more than two hours, not one hour, so I’m not sure that the recipe you referenced is correct. Here is the original recipe, straight from Tage Hojefeldt, the late chef. Be careful to not over beat the batter, which will produce an airy rather than a dense cake. When I tested the recipe, I baked it in three graduated springform pans, the kind sold in a set. I baked the cakes directly on the oven rack, not in a boiling water bath. The key to producing a cheesecake that doesn’t crack is to bake it until it is mostly but not quite set. The center should still jiggle. It will firm up as it cools. For the crust: Stir and toss crumbs with melted butter. Press equal amounts into the bottoms of four 8- or 8 1/2-inch-round springform pans, or a 9 1/2-, 8 1/2- and 7 1/2-inch pans. Set aside. For the cake: In a 5-quart mixer bowl, beat cream cheese with an electric mixer until fluffy. Slowly beat in flour, then sugar. Add salt and sour cream and beat until smooth, scraping down sides occasionally with a rubber spatula. Add eggs one at a time, beating on low speed after each addition just until egg is incorporated. Bowl will be very full. Turn off mixer. Scrape bowl and stir with a rubber spatula until batter is uniformly mixed. In a very large bowl, beat whipping cream until slightly thickened. While beating, slowly add sugar, vanilla and lemon juice until soft peaks form. Pour one-fourth of the cream cheese mixture into the bowl with the whipped cream and fold until incorporated. Add half of remaining batter and fold again, then fold in remaining batter. Pour over crusts in springform pans. Place in a boiling water bath and bake in a preheated, 325-degree oven for about 2 1/2 hours; or place pans directly on oven shelves and bake in a preheated, 350-degree oven until cheesecakes are almost set. To test for doneness, gently shake pans. The cheesecakes should still wiggle slightly in the centers. Without the water bath, baking time will be about 40 minutes for a 7 1/2-inch cake, 50 minutes for an 8- to 8 1/2-inch cake, and 60 minutes for a 9 1/2-inch cake. Cool to room temperature, then refrigerate. Before serving, run a sharp knife between the cake and sides of the pan. Release the clamp, spread the sides and lift the sides off the cake. Top with pie filling and decorate with whipped cream, if desired.